Discussion in 'Guitars in General' started by Mikey Likes It, Jan 23, 2012. 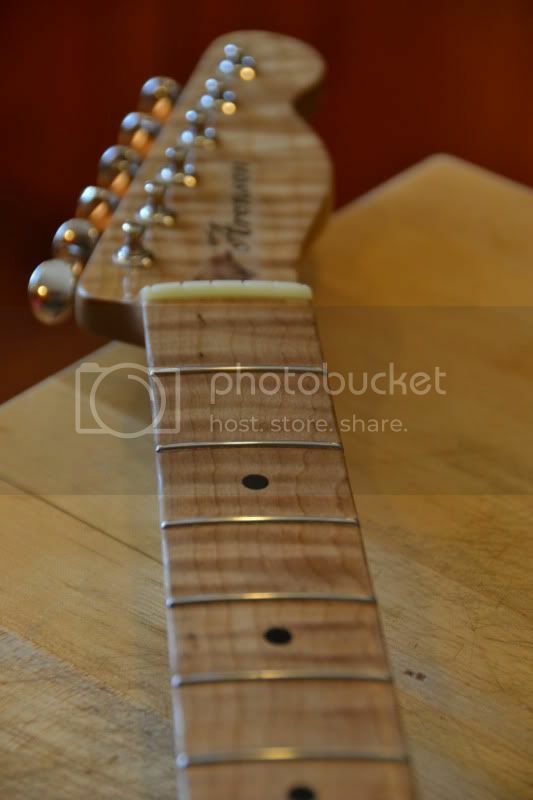 Heavily flamed maple neck (I used roasted maple, courtesy of Tommy Rosamond) - the neck is quite beefy, 0.95" at the nut and 1" at the 12th fret, V to C contour, 9.5" radius, 1-3/4" nut, vintage stainless steel frets and a very thin nitro finish.The neck is bolted on using stainless steel bushings from Onyx Forge. 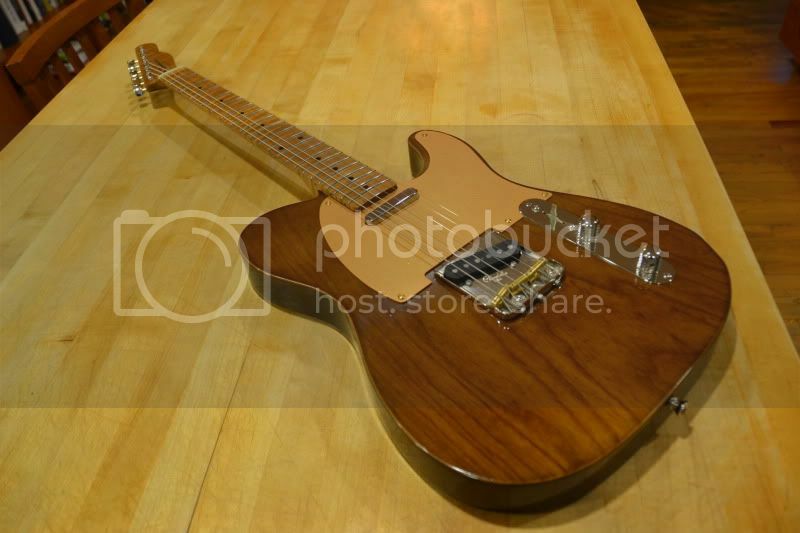 One-piece light (just under 4 lbs) swamp ash body with a walnut stain, Glendale bridge (the bridge and saddles you see are temporary - I'm still waiting for the no-cut plate and twang saddle set that Redd wants but used this bridge so I could finish the nut and do some setup work). Electronics include a vintage kit from RS and a set of Fred Stuart Black Guard pickups. Redd got the anodized gold aluminum pick guard from Tone Guard.I sure hope Redd likes it as much as I do! wow! can't wait to hear Red play that. gotta catch him next time i'm in Austin. my brother is a big Volkaert fan and sees him several times a year. I'll be on the lookout for this down at the Continental. Nice job!! Sure hope you see and hear it at the Continental! I'm trying to decide whether to trust FedEx with it or just fly down myself for a couple of nights and soak up some good music while I'm there. Wow, what an honor to be able to build a beautiful instrument for an awesome musician! Your very fortunate and gifted! It sure is a lot more comfy than that cold ya'll been getting up there. That guitar looks excellent. I love that "bone" maple that Tommy seems to be able to find. Sounds like Redd's necks are not that different from what I've been doing. Hadn't tried the Roasting yet. There's always next batch. Tommy always does me right. First roasted maple I've tried; it's lovely, and the guitar sustains forever. And the plan is for Redd to wear the finish off pretty quickly and oil it with his own sweat, which is what he did on his '53. These roasted necks are warranted without finish, so I think it'll hold up pretty well. I had the pleasure of meeting him a few times and seeing him play several while I was living in Austin. Nice guy and a monster player! I vote for a visit to Austin. Might as well see him play it firsthand. 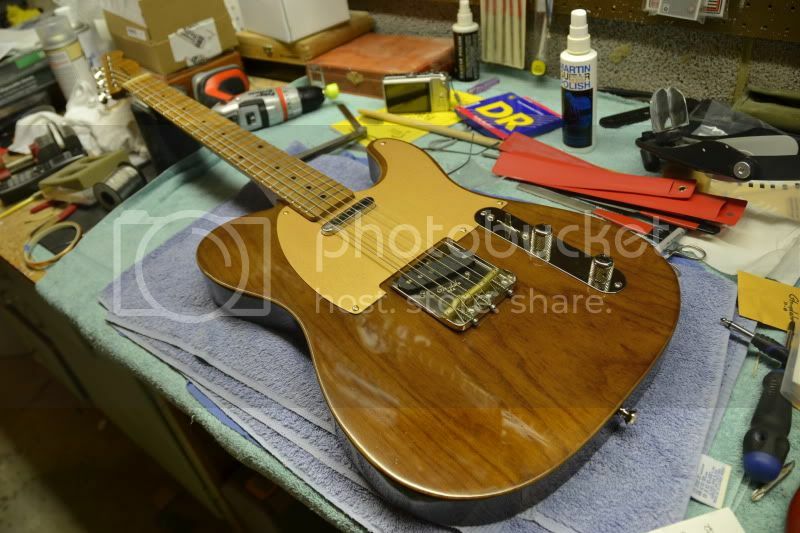 that's a fine looking Tele, sir - good job. ... or just fly down myself for a couple of nights and soak up some good music while I'm there. Great job, well done. Redd's a beast, I'm hoping to get down again there sometime this year, hopefully to see your fine work as well. What's the total weight ending up at? Very well done and I am sure Redd will do it justice. Thanks for the kind words, folks. I haven't weighed her, but will do so tonight.